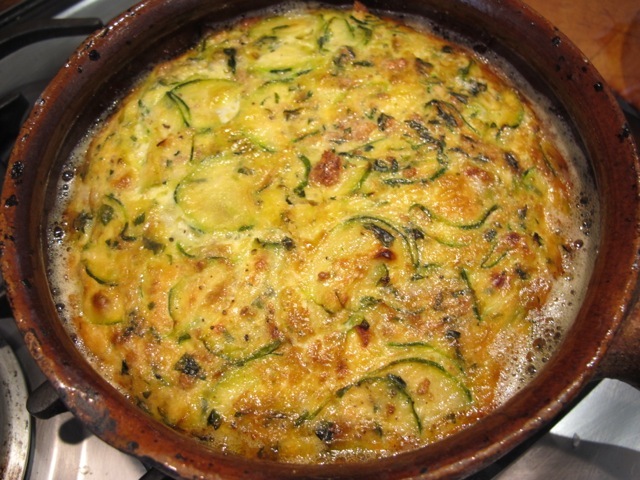 Another last “hurrah” for the courgette-zucchini! 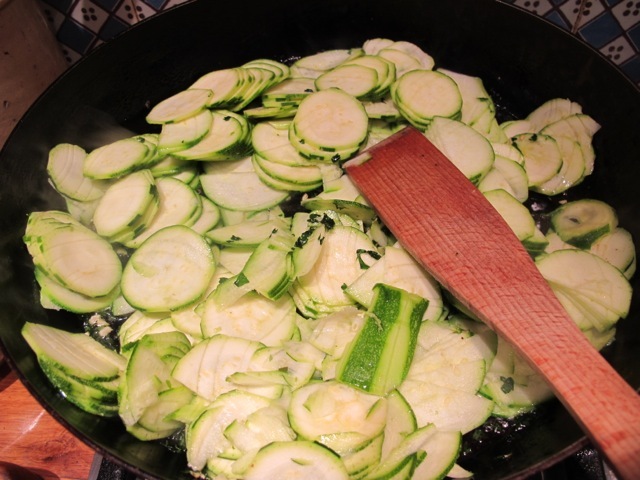 Two of the three I used for this dish came from our vegetable patch–even in mid-October the last surviving zucchini plant is turning out courgettes–and perfect specimens they are. Almost a pity to cook them! However they made a light and creamy lunch! 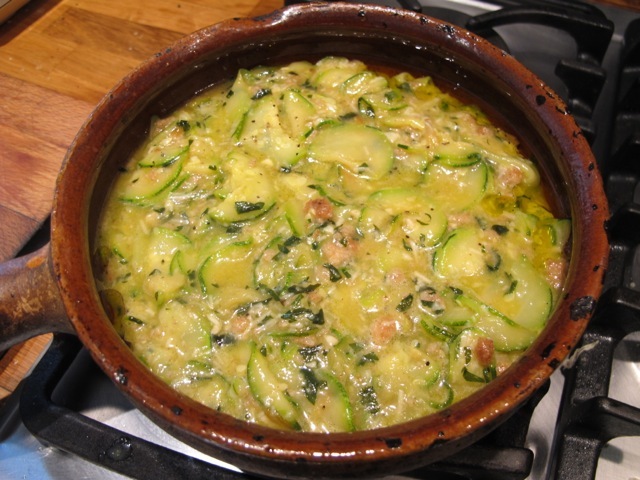 This is adapted from a recipe in the excellent Italian Vegetarian Cookery by Paola Gavin. 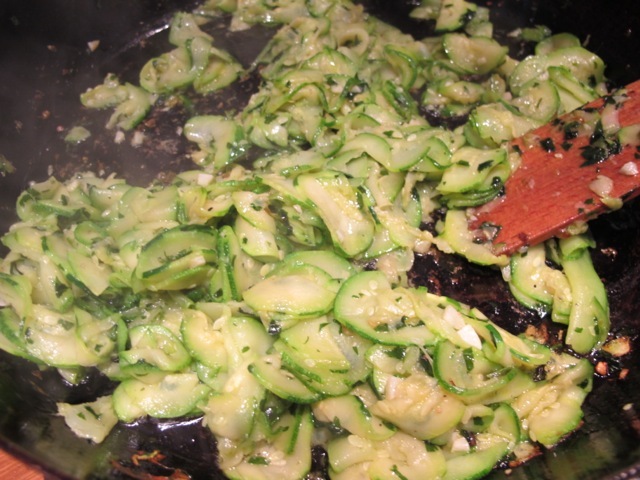 3 medium courgettes/zucchini–passed through the thin slicer of a food processor. 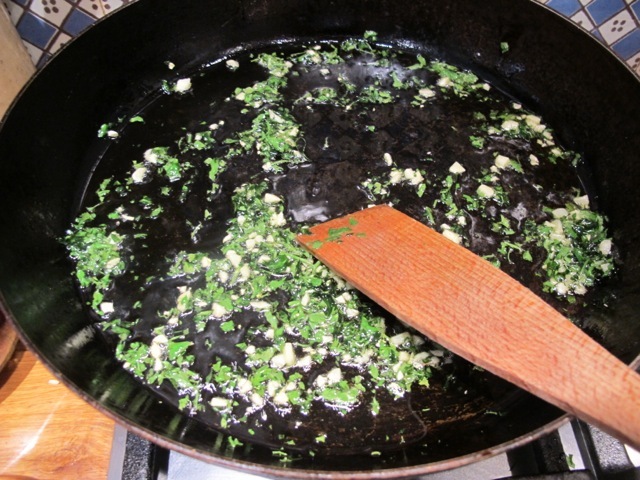 Add the garlic and parsley and cook, stirring, for less than a minute. and cook until they wilt and take on a bit of color. Turn off the heat and let them cool. Tip the pan a little to drain off some of the oil. Add the breadcrumbs and grated cheese and mix thoroughly. 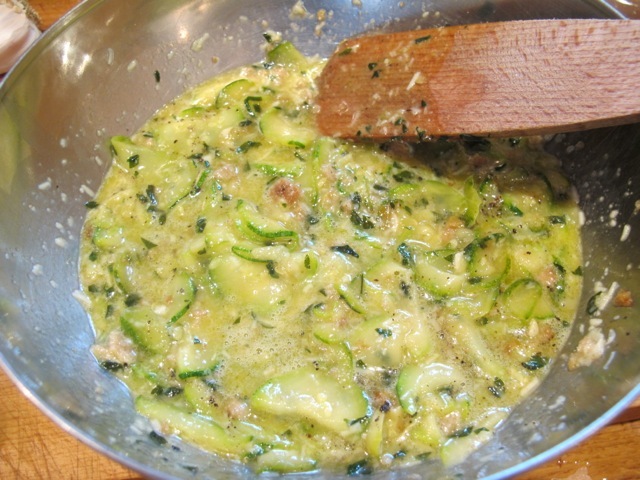 Add the courgettes to the egg mixture and blend carefully. Oil an oven dish and pour in the mixture. Cook in the middle of the oven for about 25 minutes. It should be nicely browned on top; but check after 20 minutes–ovens vary and you don’t want to lose the creamy interior; inserting a knife through the top, will help you judge. This was taken half-way through lunch! We had it with new season’s broccoli–lightly steamed. A friendly meeting of summer and autumn. Neat letter in today’s Grauniad – a couple went inter-railing in France, and slept in a courgette! V best to you both, Mark. Thanks Mark–I’ll look it up! My Mother embarrassed a twelve year old in 1954 by asking the Wagon-Lit attendant in Calais very loudly in English but with a french accent–“Do you ‘ave a couchette”! Easy peesie! Looks great too! Robin, this looks divine. do you ever use the flowers? 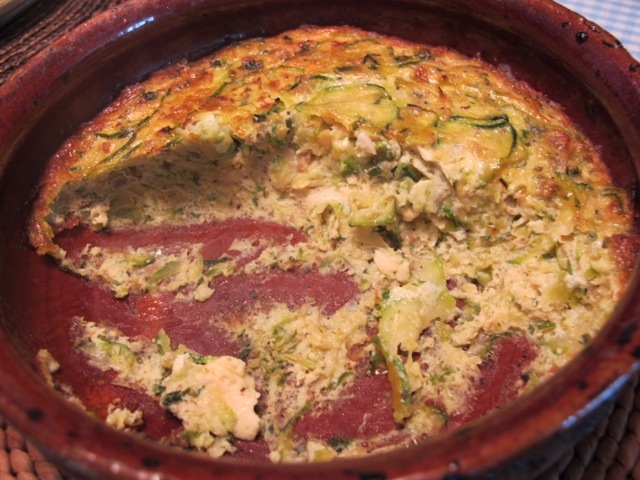 Not really–there are never enough chez nous and it is less of a tradition in France. Thank you Robin !! Another healthy and tummy warming meal…sure you can tell I am not a professional food critic ! I guess your next book will be called 101 ways with courgettes! Are we going to be treated to pics of your October cooking weekend? Sadly not–we had cancellations and decided to take a raincheck until May. 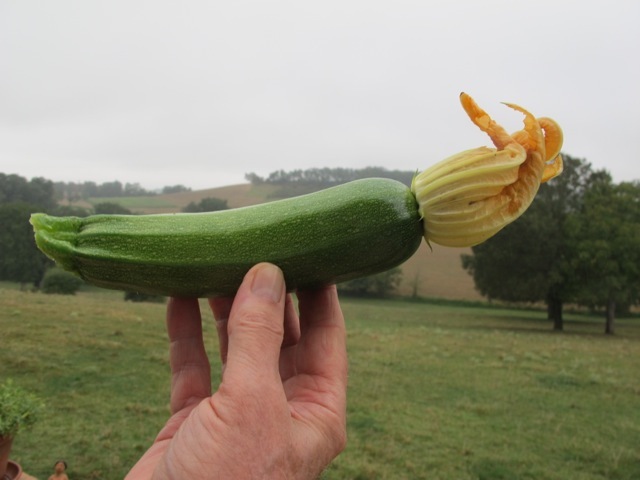 I may be courgetted out–or maybe not! I have read about the flowers. Well, may I give any suggestions to cook them if you have chance to get them? 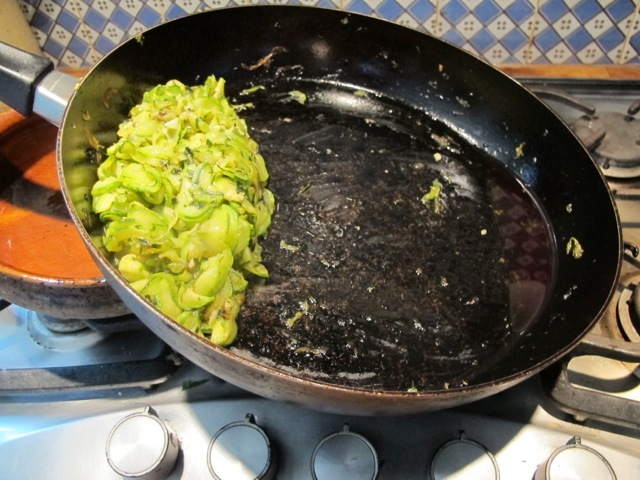 In Centre/South Italy (not common in the North) we are used to frying them after having cleaned and briefly washed them (taking out the pistil and some green parts outside the flower), inserted some mozzarella cheese and anchovy and then battered. This is a fry so it is better not to eat it very often but they taste delicious! One of these days, Paola–thank you! See you in Firenze perhaps.